A lonely middle-aged woman is forced by circumstance to let out her house to a film crew. She is attracted to the charming director and he exploits this fact to suit his purposes. 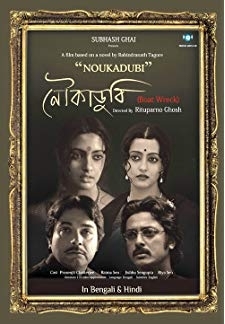 © 2018 Scratchu.com Bariwali | Kiron Kher, Chiranjit, Sudiptaa Chakraborty, Surya Chatterjee, Rupa Ganguly, Abhishek Chatterjee, Shivprasad Mukerjee, Kaushik Bose, Subir Chanda, Rukkmini Ghosh, Shiboprosad Mukherjee, Chandan Sen, Ashoke Viswanathan - Bariwali (2000) | Bengali Movie | 7.2/10 | Synopsis : A lonely middle-aged woman is forced by circumstance to let out her house to a film crew. She is attracted to the charming director and he exploits this fact to suit his purposes.... Watch Online!! !